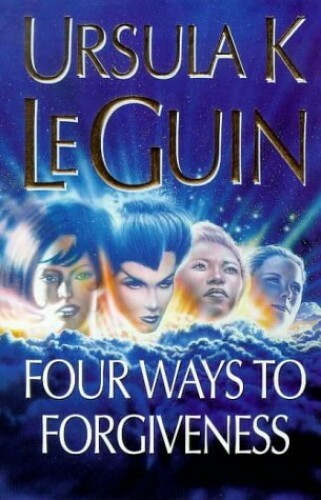 I love the title of Four Ways to Forgiveness by Ursula Le Guin. It’s a short story collection and normally I would steer clear of short stories as I don’t find them as satisfying as novels. This book came to me as part of the collection from an emigrating friend and, while I didn’t connect with the Earthsea series, I’d really enjoyed The Left Hand of Darkness. A combination of title and author drew me to the book. The four stories in Four Ways to Forgiveness are set in the same world/universe as The Left Hand of Darkness on the planets Werel and Yeowe. Werel’s societies are based on enslavement on one ethnic group by another. One nation, Voe Deo, colonised a nearby planet using a largely slave population to exploit the planet’s resources. The first story, Betrayals, is set on Yeowe after the War of Liberation, in which the slave population overthrew the bosses. Yoss is a retired school teacher who reluctantly cares for her mad neighbour, Abberkam, who was a war lord and now lives alone in a sparsely populated area of Yeowe. Yoss has reasons to hate Abberkam and reasons to distrust men in general, but an attachment forms between them. Then Yoss’s house burns down: Abberkam rescues her cat and offers her a room in his house. I liked this story the most. It is gentle and wistful, yet approaches some heavy themes. It talks about forms of oppression and how freedom requires more work than simply overthrowing the masters. Age has mellowed two characters who might have been enemies in their younger days, and the relationship is facilitated by Abberkam’s confessions, apologies, and adoption of more respectful behaviour. It is both sweet and real. Forgiveness is reached through time. Forgiveness Day moves to Werel and the story of an Envoy of the Ekumen in one of the smaller, more traditional, countries. Solly is a female of an egalitarian society and she struggles to adapt to a patriarchal system. Although her struggle isn’t as great as Gatay’s struggle to accept a female Envoy. She strikes up a friendship with a member of a troupe of entertainers – they are transvestites and it is considered shocking to openly associate with them – who also happens to be involved in a movement to liberate Werel’s slaves. The story touches on Solly’s attempts to treat the slaves she’s given as equals and their resistance to her behaviour. There is a terrorist attack and Solly and her bodyguard are taken hostage. During their captivity they come to know each other better and understand the roots of the things they had been offended by. Forgiveness is reached through understanding. The third story, A Man of the People, is also a story of an outsider to the Werel/Yeowe system. Havzhiva is Hainish and grows up expecting his life to follow a defined pattern. He grows to realise he wants more and leaves his community. It’s a difficult choice as few people leave their community and, if you do, you can never really go back. You might be able to return physically but the psychological connection has changed. Havzhiva spends his youth studying and exploring relationships. Eventually he becomes ambassador to Yeowe and it is there he finds a home. The society is struggling with change. The men believe themselves free but the women find themselves oppressed by the former male slaves. Everyone carries the physical scars of slavery and war. Slaves were allowed no family life or education and those institutions are in their infancy. The cities are changing (progressing) faster than the rural areas. There is conflict between different visions of a free Yeowe. Havzhiva forms a friendship with a nurse that lasts lifetime and at the end he tells her he has learned acceptance. Forgiveness is reached through acceptance. A Woman’s Liberation, the final story, is the story of Rakam, a female slave. As a child she grows up in a compound and sees her mother rarely. Her mother goes to the house and is not a field slave. As she grows, she knows her skin is darker than the other slaves and comes to realise this is because one of the bosses is her father. Her mother secures her a place in the house as slave to the plantation owner’s wife, Lady Tazeu. She is raped repeatedly by Tazeu, who is isolated and lonely and has limited freedom of her own. Rakam is given to the boss’s son, who refuses to use her because she can’t consent, and tells her that he is working to free all his father’s slaves. When the estate is destroyed and the slaves take their freedom they are simply captured again and taken to another estate. Conditions have become harsher. Rakam says she has papers but they are taken from her. The path to freedom is dangerous and is not one act of liberation but must be defended everyday. Rakam is freed again and makes her way to the city where she educates herself. This story reflects how people internalise the philosophies of oppression as children and must work hard to change what they believe about themselves. Rakam realises that there are layers of freedom struggle. This story is most directly analogous to the institution of slavery on our own world and the complexities of liberation experienced by the enslaved. Rakam becomes a teacher and a writer, a powerful voice and a respected academic. Forgiveness is reached through achievement. The stories of Four Ways to Forgiveness are all linked and together build up a picture of changing societies and the struggles of the people seeking emancipation. The writing is elegant, the characterisation is deft. These are deeply political stories yet character always comes first. I found them enriching and moving. Not only did I enjoy them as stories, but I learned something about the human experience. Wonderful.